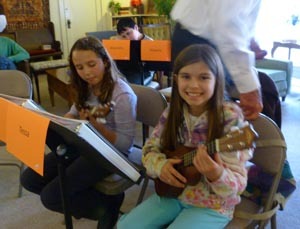 Chico Children’s Ukulele Group is a non-profit community organization dedicated to providing fun, interactive music instruction to students in elementary school. Our highly qualified teachers lead weekly group lessons featuring beginning skills: reading music, picking melodies, strumming chords, and singing–all through learning to play the ukuele. At the end of each semester, students present a spirited concert assisted by a backup band.